This product is included in my 2nd Grade Interactive Notebook for Close Reads Bundle. Save 10% on this item and my Interactive Notebook for Close Reads of Literature by purchasing this bundle. Interactive notebooks are a great way to engage your students in learning content. 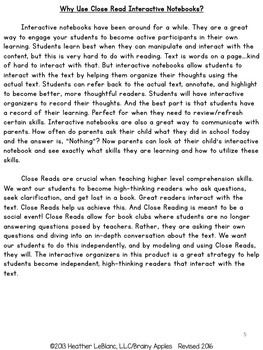 Close Reads are an important strategy to use to help your students read at a high level. Combine the two and you have an interactive way for your students to use higher-level thinking when reading texts! This product contains interactive organizers that students use while doing Close Reads. This interactive notebook can be used during reading time, science, or social studies, because we know how important integration of reading and the content areas is. This product explains how and why you should be using an interactive notebook during Close Reads. 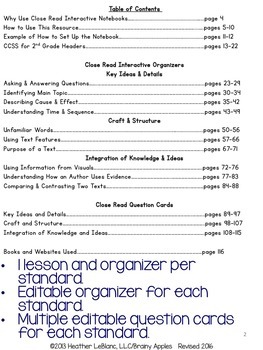 Also included are CCSS headers for 2nd grade IF you want to use them, an explanation of each skill included, interactive organizers that support students practicing those skills, an example lesson so you can see how to use each interactive organizer, an answer key for each lesson with possible student responses, and question cards with Close Read questions. After teaching the example lesson (if needed), you can choose any text you would like to use with each interactive organizer. The interactive organizers in this product can be used over and over again with different texts. I have also included question cards that students can glue into their notebooks for times when you don't want them to create an interactive organizer and you want them to quickly answer the Close Read question. This also works very well for assessing students! The interactive organizers included in this product are more advanced than in my Interactive Notebook for Close Reads: Beginner's Kit. The interactive organizers included in this product can be colored to make it more attractive, although they certainly don't have to be colored. This product is for informational text. You can find my Interactive Notebook for Close Reads for Literature here. This file is a Zip file. It includes 1 PDF file of the actual product, and 1 Powerpoint file that includes the editable interactive organizers and question stem pages where you can type in your own questions. The font used is KG Primary Penmanship and you will need to download it for free to use it. However, this isn't necessary. I have included the link to this font in the PDF file if you would like to download it. Please ask any questions before purchasing. For each example lesson, I have included information on the book/website needed. You don't have to use these sample lessons, only if you need to see how students are to use the interactive organizers. This product does NOT include text excerpts. Why are text excerpts not included? Because you know what is best for your students when it comes to reading selection. You can select text excerpts from novels you are already reading in class or portions of an informational text you are using during science or social studies. And, most importantly, copyright law does NOT allow for copying portions of text for distribution. Hence, I did not include any. 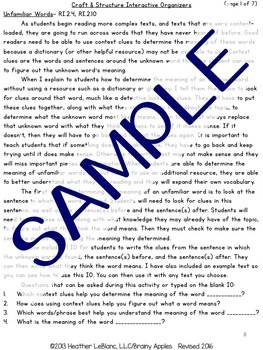 However, you ARE able to copy a small portion of a text for your own classroom use. An easy resource to begin selecting excerpts from is Appendix B if you have never done this before. This resource has a lot of excerpts that you can use for your students. Simply copy the excerpt and pass it out to your students. Learning how to find your own excerpts is very liberating because you are no longer restricted to passages provided for you. You can use ANY piece of text that fits your purpose. Included in this product is a more detailed section on how to select text excerpts for Close Reads. I also don’t always give my students a copy of the excerpt to glue into their notebooks. Sometimes I put the excerpt on the Smart Board or I have them use a book they already have and I just didn’t have time to make copies. That’s OK! The only difference is students won’t be able to annotate or highlight in the text, but they will still be recording their responses on the interactive organizers. I did not type up passages for this product because students need to be reading real and authentic texts that are rich in variety and content. 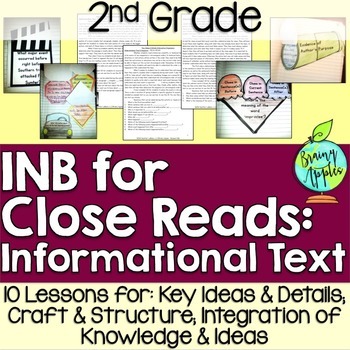 Close Reading is a strategy that I began using last year and I could see such HUGE growth in all my students whether they were struggling readers or advanced readers. Selecting text excerpts specifically for your students allows you to select the perfect level to help your students progress their reading ability. Be sure to follow my store so you will be notified of when I release additional Close Read resources.